Davies, 48, sits in his brightly lit studio with all 6’ 3” of his burly frame leaning over a small anvil. A thin band of copper is resting between his fingers as his small hammer works the soft alloy into the finishing collar for a lamp dome. Two copper spheres sit on his work bench, each dappled with small indentations where his hammer has shaped them. Davies’ finished work can be found around the world – all hand-hammered and custom designed. He created three chandeliers for the home of husband/wife film collaborators Peter Jackson and Fran Walsh of Lord of the Rings trilogy fame. At the Pennsylvania Mercer Museum, they needed lighting for a permanent exhibit of 18th and 19th century American life and the lantern wall sconces Davies created blended perfectly. And it was that mastery of old-world craftsmanship that led Davies to the delicate repair of a lamp created by Dutch American artist Dirk van Erp for West Coast Chopper kingpin, Jesse James. Though his work is widely recognized, it is all created locally. A Washington native, Davies’ father was a Boeing executive and the family travelled during his youth. 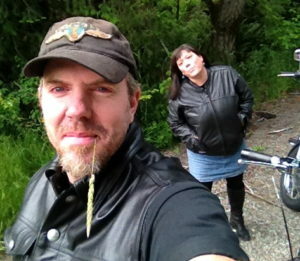 When his cousin recommended Evergreen State College to him, Davies decided to give it a try and graduated in 1994. “And then I stayed. l didn’t plan to stay, but it worked out that way.” During the interview, Davies continues working. He has a deadline – now cutting wide-gauge lengths of copper that will also be used for the pair of lamps he is working on. The studio is quiet while he shapes a band of copper inside the dome. 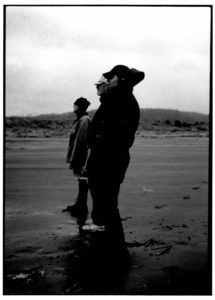 Davies, former singer and sax player for the bands the Dirty Birds and Resident Kings, says that it has been tough not having a band the past year. He hopes to get some music going with the rhythm section of his former bands and get out the saxophone and harmonic and, as he puts it, “do that again” by mid-summer. This “can do” attitude stretches to his love of motorcycles. He engineers and machines forks for the custom choppers he builds, creating parts when needed. 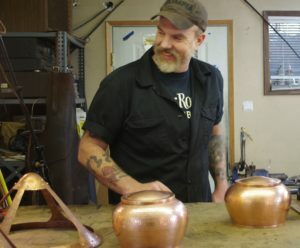 He especially enjoys making one-of-a- kind tanks, one of which he created from copper. Davies rides dirt and street bikes and, like any true motorcycle enthusiast, admires them all. As the summer rolls along, Davies can be found cruising through town on one of his custom choppers, or, hopefully, on stage playing with old and new bandmates in some new musical incarnation. Unless, of course he is in his workshop. Tapping away, enjoying the journey toward his next functional work of art.